O M ARNOLD (1939) The 67 foot 74 ton wooden oil screw O M Arnold foundered during a storm in Chatham Strait at 11:20 a.m. Friday August 18, 1939. The vessel departed Chatham August 17th bound for Noyes Island with 8 crewmen aboard. George Lee of Seattle, master of the O M Arnold, his father Andrew Lee of Angoon and Ernest Kruse of Juneau were lost in the disaster. Survivors included Otto Waage formerly of Greenbush MN, Knut Solbick of Juneau, Ed Megard of Arlington WA and W H Meeker of Bremerton WA. The vessel was struck by a tremendous wave and foundered a half mile off Timbered Islets loaded with 60 tons of fresh salmon worth $1,800. Only five of the crewmen made it to safety. The O M Arnold was valued at $20,000. OAKLAND (1912) The 146 ton 103 foot wooden gas steamer Oakland stranded and was lost at the entrance to Dry Bay just before noon October 23, 1912. The vessel had just departed Dry Bay bound for Seattle with eleven crewmen aboard. She was carrying a 125 ton cargo of canned salmon and supplies as well as a deck load of empty oil drums. The Saint Elias Packing Company was operating the vessel having contracted to purchase it from the Alaska Steamship Company. The wreck report attributes the disaster to a moderate gale and heavy snowstorm. No lives were lost, but the Oakland, valued at $20,000 and her cargo, worth $9,475 were total losses. The vessel was insured for $15,000 and her cargo for $9475. Source: U S Customs Wreck Report June 13, 1913 at Puget Sound by R R Piesom, Supt. The Oakland was valued at $3,500 and had no insurance. OAXACA (1998) The 36 foot crab fishing vessel Oaxaca grounded and was lost February 15, 1998 in Glacier Bay. Both crewmembers made it to safety. OBAN (2005) The 41 foot seiner Oban grounded and was lost March 23, 2005 on the northwest corner of Duke Island approximately 10 miles south of Annette Island. Both persons on board abandoned ship to a Metlakatla Fire Department skiff that transferred them to the Good Samaritan Vessel Skip Jack. They were transported to Ketchikan where they began efforts to mitigate pollution and possibly salvage the Oban. OCEAN HOME (1990) The 46 foot fiberglass longline fishing vessel Ocean Home was consumed by fire from an oil stove May 1, 1990 at Cape Spencer. All four crewmembers abandoned ship to a skiff and were rescued by the U S Coast Guard Cutter Naushon. OCEAN PACIFIC (1989) The 166 foot steel salmon processor Ocean Pacific capsized and sank in 22 fathoms of water August 12, 1989 at her mooring in Tongass Narrows. There was no loss of life. All 68 people aboard were evacuated to a fishing vessel nearby before the Ocean Pacific sank. Lost with the vessel were 200,000 pounds of processed and frozen pink salmon and 120,000 pounds of pink salmon in refrigerated seawater. A transfer of ballast water to compensate for a list, caused fish in the tank to shift allowing water to flood in from a discharge line eventually causing the vessel to capsize. The Ocean Pacific was built during WWII as a motorized barge, had served as a private yacht in New Orleans and ended her career as a seafood processing vessel. OCEAN SUNRISE (2001) The 42 foot shrimp fishing vessel Ocean Sunrise sank after taking on water in high seas October 28, 2001 in Cholmondeley Sound, 19 miles west of Ketchikan. Robert Hanscomb and his wife Terisa were on board when the disaster occurred. The Ocean Sunrise was loaded with 134 shrimp pots on deck and six 55 gallon drums of heating oil below deck. A large gust of wind flipped the Ocean Sunrise over and she sank about 30 minutes later. After the vessel sunk, Terisa clung to wreckage and was rescued by the fishing vessel Nina Fay but Robert was lost. The U S Coast Guard and fishing vessel Rio Grande also responded to the Ocean Sunrise May-Day but were unable to revive Mr. Hanscomb after retrieving him from the water. OCEANIC (1926) The 11 ton wooden gas screw Oceanic broke loose from her moorings at Metlakatla and stranded in Sylvan (Sylburn) Harbor during the night of December 15, 1926. There was no one aboard at the time. The wind was high and from the southeast when the disaster occurred. The Oceanic was valued at $2,000 and became a total loss. There was no insurance. OCEANIC (1996) The 48 foot shrimp fishing vessel Oceanic flooded and sank December 12, 1996 approximately 23 nautical miles southwest of Craig. Kent Worth and Tara Jock were plucked from the water by a U S Coast Guard helicopter. The third crewmember of the Oceanic, Thomas Dowd, was lost. Dowd was located by the chopper, but was unconscious in a half filled survival suit which could not be lifted into the helicopter which was running short of fuel. Winds were blowing at 35 knots with seas to 20 feet. ODIN (1958) The 19 ton 39 foot wooden gas screw fishing vessel Odin burned March 2, 1958 at Petersburg. ODUNO (1939) The gas powered salmon fishing vessel Oduno is reported as having been lost off Noyes Island while engaged in fishing in 1939. All 12 crewmen were lost. OHIO (1898) The schooner Ohio went adrift from Port Simpson, British Columbia in December of 1898. A strong gale hit and set the vessel adrift from her place of anchorage. 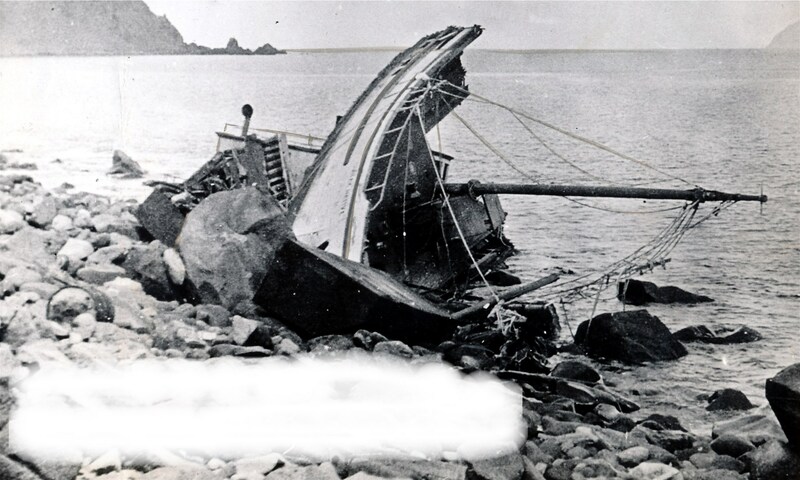 The Ohio drifted and eventually ran aground on a reef off of a small uninhabited island near the south end of Revillagigedo Channel. The crew lived on seaweed and mussels for a week before they were found by Natives. They later returned to Port Simpson. The vessel was a total loss. OLE II (1947) The 8 ton 32 foot wooden gas screw fishing vessel Ole II burned in Union Bay August 8, 1947. The Olga was valued at $3,000 and reported as a total loss. There was fishing gear and personal effects aboard worth $700, some of which were salvaged. The vessel was insured for $2,000. OLIVUS (2000) The 35 foot wooden salmon troller Olivus flooded and sank in a dense fog at 11 p.m. August 28, 2000 near Helm Bay, northwest of Ketchikan. Only one of the two crewmembers survived. The Olympic was valued at $500 and had no insurance. ORCAS (1999) The 65 foot wooden derelict fishing vessel Orcas flooded and sank October 31, 1999 in Thompson Harbor, Sitka. No one was aboard at the time of the sinking. The Oregon City, valued at $6,000, was a total loss along with her cargo. The crew made it to safety aboard the gas boat Monitor. OREGON WOLF (1954) The 48 ton 58 foot wooden oil screw Oregon Wolf foundered September 25, 1954 about three miles east of Turnabout Island in Frederick Sound. ORION (1960) The 23 ton 43 foot wooden oil screw fishing vessel Orion disappeared October 8, 1960 on a voyage from Hydaburg to Ketchikan. Clarence Sims was the only person aboard. OSO (1978) The troller Oso drug anchor in a winter storm, struck a rock and sank December 30, 1978 off of the west coast of Chichagof Island near White Sulfur Springs. “Oso” Pete Liadol was the only one aboard and made it to shore in a skiff. He took shelter in a cabin and lived on clams until rescued five weeks later by the fishing vessel Midnight Charger. The crew all survived the disaster, but the Osprey, valued at $10,000, sank and was a total loss. There was no insurance.